Yes, today is the last day of June and tomorrow is the first day of July. 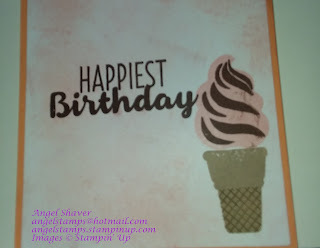 But, with Stampin' Up it is so much more. There are some amazing promotions happening right now. Today is your last day to earn extra stampin' rewards through the We Heart Hosts promotion. You do not have to host an event to be qualified for this promotion. 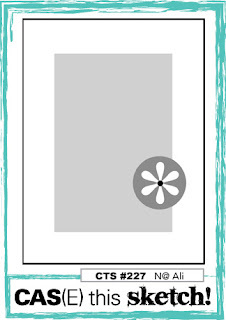 Any order over 150 CSV (which in the US is $150) will earn you Stampin' Rewards or FREE products. 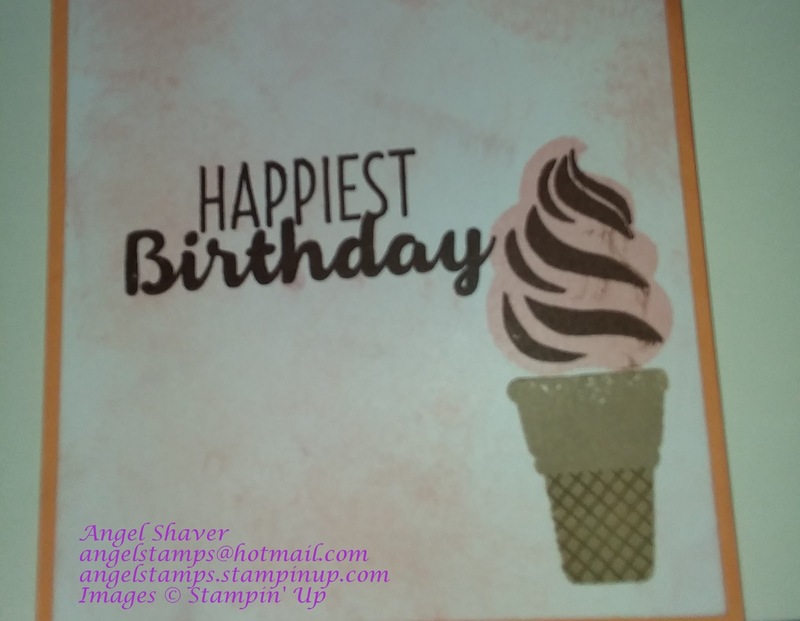 During this promotion, any order over $350.00 will earn you an extra $35.00 of Stampin' Rewards. 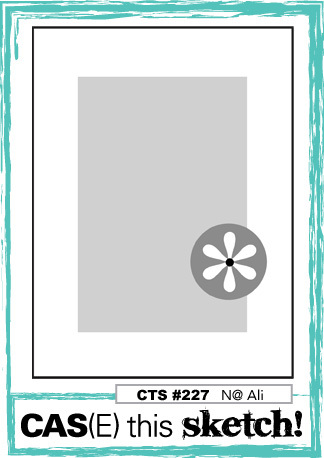 That is in addition to your regular Stampin' Rewards. But, that ends today. Today only there is a Pamper Pumpkin Special. New US customers who subscribe today, by 11:59pm MT pay only $5 for their first month and only $19.95 for additional months. That price includes shipping. If you were ever thinking about trying out Paper Pumpkin, this is a great time to try. I've never seem a better deal. Even when there was a buy 1 month get the second month free deal, that was only 50% off. This is 75% off your first month. And, if you don't love it, there is no pressure to continue. Subscriptions can be suspended or cancelled at any time. Why not join today? My Paper Pumpkin subscribers also get a membership to a private Facebook group and some alternate project ideas. Bonus Day are here again. For every $50.00 you spend in July (before tax and shipping), you earn a $5.00 coupon you can use on your orders in August. 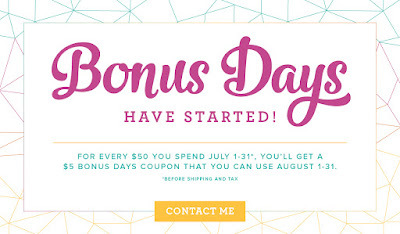 There will be an early release new bundle from the holiday catalog that you can order in August and use your Bonus Days coupons toward if you so desire. Speaking of holiday catalogs, I can make my customer list for the Holiday Catalog in July. Every customer who has placed an order or attended a class in 2017, will receive a Holiday Catalog for free. If you would like a 2017 Holiday Catalog and you haven't placed an order in 2017, you can place your order before July 31 and I will put you on the mailing list. Catalogs will be mailed from the Stampin' Up home office around August 7 and will take 2-3 weeks to arrive at your home. 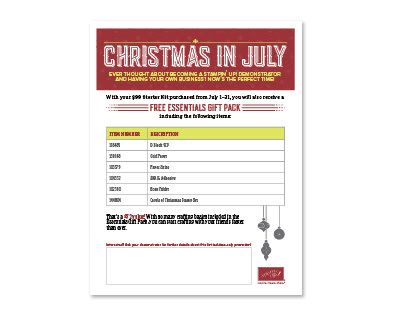 Those who join in July will receive a bonus FREE essentials pack. 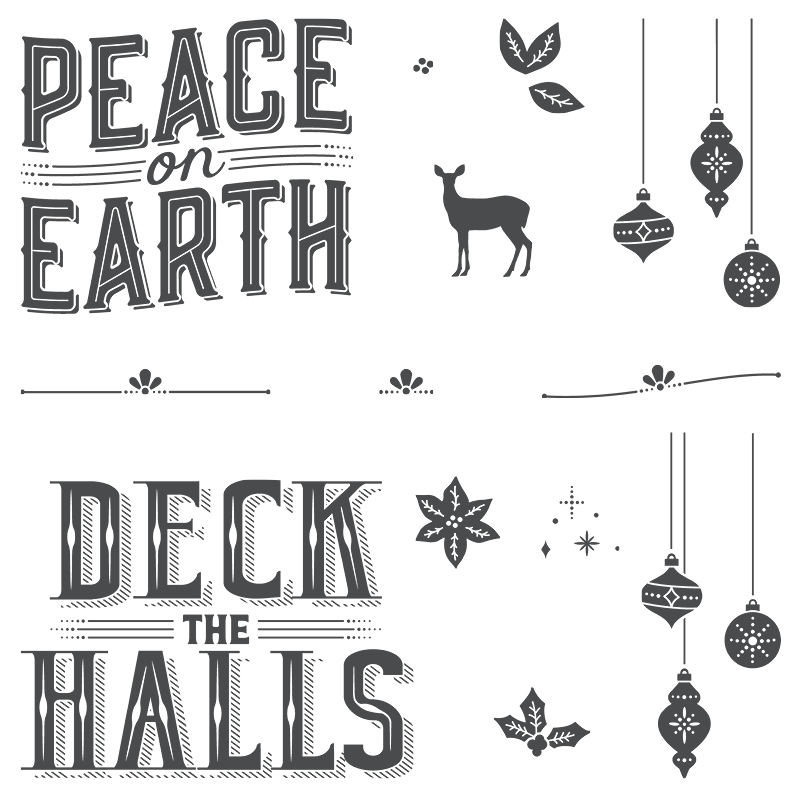 Not only will you get $125 of Stampin' Up product of your choice for $99 (includes shipping) and $50 worth of business supplies, you will also receive a FREE essentials pack that will include 2 size D blocks, paper snips, SNAIL adhesive, grid paper, a bone folder, and the Carols of Christmas stamp set. Besides all the amazing stuff that you will get in the Starter Kit, you will also have access to the Demonstrator website, training from Stampin' Up, a wide family of stampin' Up demonstrators who provide support, encouragement, and a creative boost, and more. If you join my team, you will become a GRRRace Inker and have access to a private Facebook page, team training, a team newsletter, occasional SWAPS, opportunities provided by my uplines, and access to me for questions, support, etc. If you enjoy my posts, sign up by email so you don't miss any when I post. Sign up for my newsletter, to receive updates on specials and upcoming events. If you live in the USA, to shop for Stampin' Up products or to join my team and become a GRRRace Inker, click on the buttons below. It's Thursday and time for another video. This Thursday happens to be the fifth Thursday of the month, so I get to pick which stamp set we get to play with today. I've decided to use fifth Thursday videos to teach a technique. Today we made a shaker card. If you really want to check out Take 1 and see what happens when I'm trying to work out a card live on video, you can watch it here. To see Take 2, watch the video below. This shows the technique after I've had time to practice and use both the grid paper and Stamp-a-ma-jig. Check out the video to see how I made today's card. I love the Cool Treats stamp set and the way you can easily add detail and shading to your images. If you enjoy my posts, sign up by email so you don't miss any when I post. Sign up for my newsletter, to receive updates on specials and upcoming events. 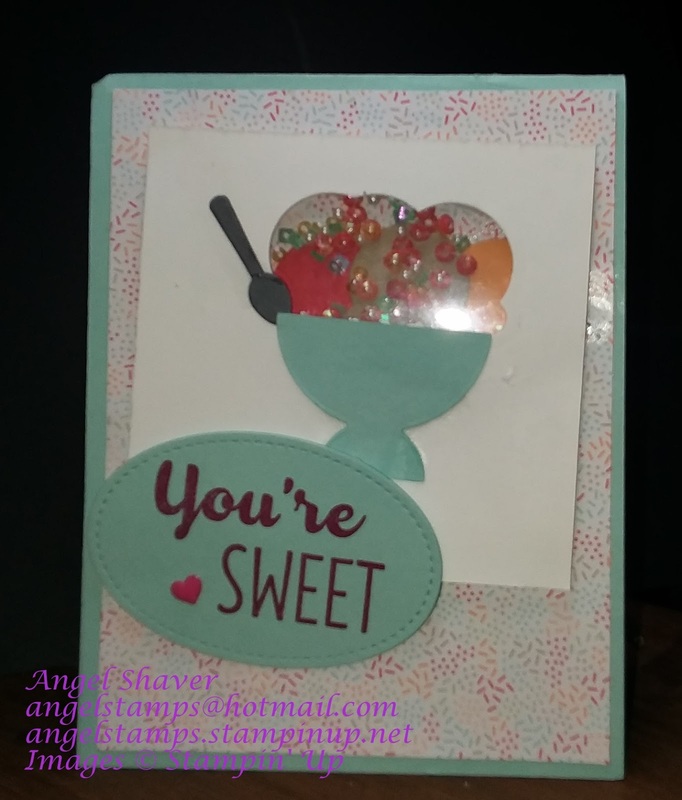 If you live in the USA, to shop for the products used to create this card or to join my team and become a GRRRace Inker, click on the buttons below. 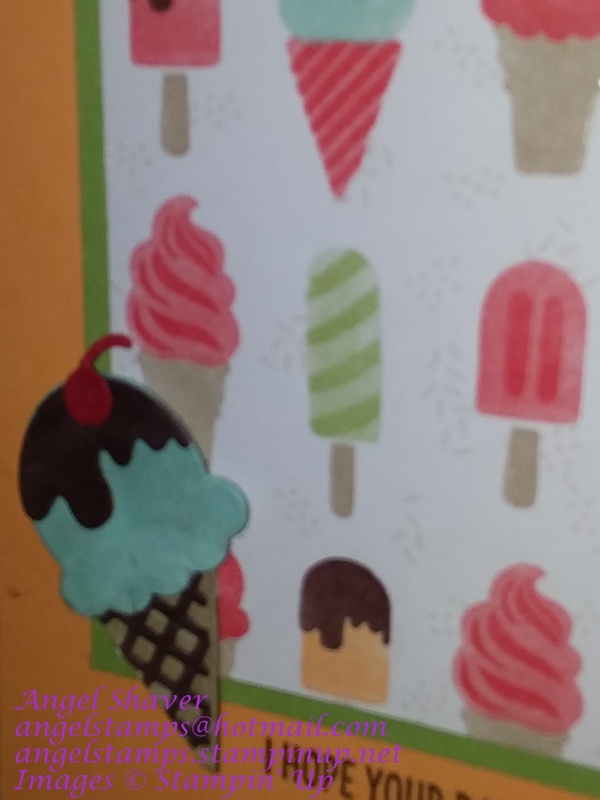 Today I pulled out the Cool Treat stamp set and Frozen Treats thinlits to play with for this challenge. I absolutely love this set and to tell the truth, I got a little hungry for ice cream while I was creating it and am getting a little ice cream craving right now as I'm preparing this post. Good thing I decided to make it a birthday card. 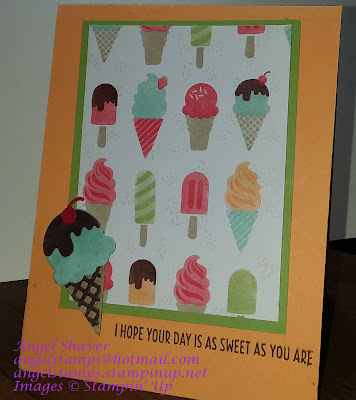 Ice cream will probably be allowed as a birthday treat if my recipient gets an ice cream craving after opening their card. :) I know this is retired DSP, but the good news is that you can use the stamp set and recreate the images if you want. I tried to use the same colors to recreate the ice cream cone I added to the front of the card. Can you find it's twin on the paper? I know my waffle pattern on the cone is darker than the picture, but I wanted to be sure it stood out. That is such a fun thinlit. 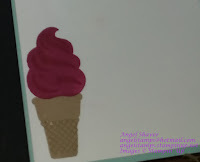 I wasn't happy with the stark white background of the inside, so I added a bit of sponging in the same color as the inside ice cream, Powder Pink. I think it softened the inside of the card. What do you thinit?